YES, I am well aware that not everyone loves tofu as much as I do. Before you all start ROLLING THOSE EYES, you can easily substitute an equal amount of cooked chicken or peeled shrimp for it in this recipe. So don’t be a baby.. GO ON! TRY IT. I dare you. Recipe adapted from Eating Well When You Just Can’t Eat The Way You Used To by Jane Weston Wilson. 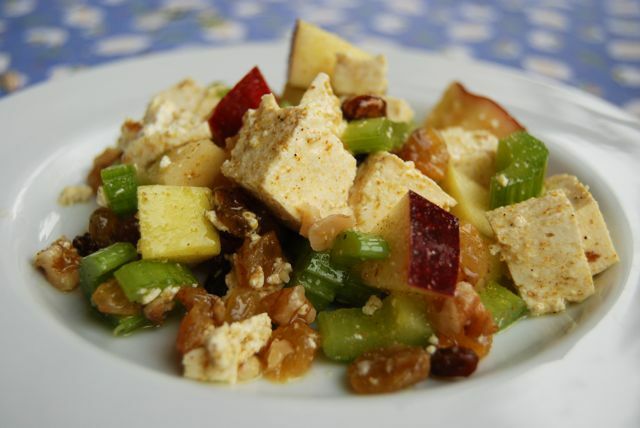 In a large bowl, combine the cubed tofu, celery, apples, raisins and walnuts. Set aside. Measure all the dressing ingredients into a small mixing bowl and whisk well to combine. Measure out 1/2 c. of the dressing, pour over the salad, and toss well to coat. Serve immediately. This entry was posted in Salads and Dressings, Vegan or Vegan Adaptable, Vegetarian. Bookmark the permalink.